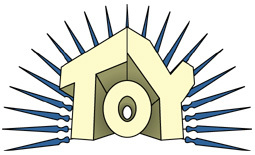 The ToY Awards started a full 10 years ago, when yo was just doing reviews on his own. Yes, there were other end-of-year awards around at the time, but most of them focussed primarily on "child safe" toys, handing out praise for educational content, safety in manufacturing, and encouraging non-violent play patterns. Yes, technically this is an entire line, but face it: it's just one toy, with four different heads and variant accessories. NECA played this one smart, maximizing their profit in a tough market. But they also passed the saving on to the fans: these could have been sold at the same $16 pricepoint as most of NECA's toys, but instead even the deluxe versions were less than $15 - and if you didn't care about the accessories and bases, you could get the figures themselves cheaper. Or heck, you could buy a box set and get them all at once. The Four Horsemen did an excellent job on the sculpt, and there's articulation aplenty (even in places you wouldn't expect it). Other nominees included McFarlane's Halo Spartans, for many of the same reasons that TMNT won • DCU Deathstroke, with its superb sculptand four holsterable weapons • U-Repair WALL*E because it looks just like the digital renders, and it has a movie-accurate action feature that doesn't get in the way of play • Legacy Collection General Grievous for addressing the problems every Grievous has had since 2005 • Ultimate Nick Fury/Captain America two-pack, because it's just an all-around kickass set • Clone Wars IG-86 is a twin-blastered, awesomely articulated, weapon-storing, sturdy figure • Stealth Strike Iron Man, a rare new sculpt in a sea of repaints • Swoop was unexpectedly one of the best Animated toys in the line • Star Wars Evolutionns Sith Legacy, which offered two new characters and one new version of a previous one, all good figures • Justice Toyman looks like a giant puppet, and moves as well as one, too • the new Millennium Falcon may be expensive, but it has a lot to offer • Mezco's Mr. Wink is a huge figure with good paint and articulation, and you can get a free replacement head to match the movie. The collaboration between the toy designers and the animators has given us some of the best-looking TF toys ever. This isn't a case like G1, where the two look nothing alike, or like the Unicron Trilogy, where the animation models were just direct copies of the toys. By working together, the two halves of TF:A both look great. But what really put the Transformers up over the competition was availability. So many popular toylines were under-ordered to the point of ridiculousness, but if you wanted Animated toys, you could go to the store any time and get them. Other nominees included TMNT and Halo • DCU Classics only lost because no one could find them • Iron Man may have only had one body repainted over and over, but it sure was great • Doctor Who is still going strong • Star Wars, for the mix of classic and Clone Wars figures and multi-packs. There have been Vaders with removable masks before, but the new one is pretty much perfect, duplicating exactly the way it came apart in the movies - helmet separate to face/scalp, and that coming off to leave the collar and chin - and it looks perfect at every stage. This would be impressive on a 12" figure, let alone on a 3¾" version! Other nominees included Crippled Bumblebee, isn't really a figure in his own right, but does add a lot of charm to his set • Two-Face's coin is remarkably clever, finding a new way to show us a very difficult object, and managing a solid sculpt of empty air • the Destroyer Droid energy shield should be translucent, but if you have two, you can make a complete ball • the TV camera included with the GI Joe DVD Battles box set • Metamorpho's limbs look seamless once they're attached • the Ark of the Covenant was adorable, yet Biblically accurate • Spirit's dart gun, with its removable clips • Gears of War brought us the chainsaw gun • Torpedo's scuba gear was a reason to buy the toy by itself • Firefly's saboteur backpack offered lots of removable goodies • Lucius Malfoy's wand/cane combo • Henry Jones' bag, umbrella and glasses • Minimate jet blasts • Doctor Who's Adipose. The packaging is eye-catching and displays the figures well, and it's easy to tell which toy is which even from the side - an important feature when faced with full pegs. And while the blister does have some useless inserts, like all packaging seems to require these days, Iron Man's packaging bothers not only to print something on the back of the inserts, it's designed to look like the inside of Tony's HUD. Cool! Other nominees were the "Last Stand" Battle Pack because it shows off the figures, as well as offering a nice generic war-torn backdrop • Masterpiece Voltron's double-sided book • DC Infinite Heroes with the hand of creation molded on the front • Bionicle Mistika tubes, which can display either hero or villain allegiances • Star Wars with the simple division between realistic and Clone Wars toys • Indiana Jones for the dynamic whip • Sideshow Toys' magnetic boxes. This line should have been great. A popular license, produced by Hasbro (the kings of 3¾" figures) with a big summer movie to help move merchandise. However, it seemed that everything which could go wrong, did. The movie underperformed, meaning the toys didn't sell. The first figures had sub-par sculpting - particularly the Harrison Ford likeness - that failed to live up to fans' expectations, and the assortments were full of minor variations of jut a few characters, rather than offering a broader scope. The early series were so heavily over-ordered that by the time changes could be made for the later, anticipated toys, no stores were interested in carrying the line, leaving fans at the mercy of scalpers on a massive scale; those first waves are still on store shelves today, not even selling on clearance. Done right, Indiana Jones could have been a ToY contender, but as it is, the line was a huge disappointment, and the Worst of 2008. Other nominees included Guitar Hero, because the figures looked so amatuerish compared to the prototypes and lacked some basic articulation • Ggruxx and Ssejjhhorr, for being such a low point in the FANtastic Exclusive line • though a new, accurate sculpt was in development for Major Bludd, it was thrown out in favor of this repainted Zartan • NECA, formerly one of the most communicative companies around, disappeared for months at a time this year, and didn't even bother to keep their own website active • Mattel, for generally cocking up every line they touched this year, including... • DCU Classics, for bad quality control and non-existant distribution • DC Infinite Heores, for being the worst 3¾" figures on the market • Movie Masters, for poor character selection, availability and paint • JLU, for supposedly being a "collector aimed" line, but still repeating all the old mistakes • MotU Classics, for taking a giant step backwards from the 2002 line, and • Matty Collector.com, for charging secondary market prices as a corporate site • Target overcharging for their exclusive ML series, then dropping the price after the first few shipments had sold. This thing is amazing! It's a throwback to a kind of exclusive we don't see anymore, but instead of shipping in a plain white box, it comes in a thematically appropriate "crate." The figure itself is highly articulated and well made. And while it's more a piece of scenery than an actual character, it's still highly playable and holds up well. Plus, its head is removable and it includes its throne, giving it the accessories it needs. As we said before, it was worth buying the random Indiana Jones toys just so you could mail away for this. Now that you know what's won this year, you can head on over to see our past winners. The Class of 2008 has joined some illustrious ranks, and they're all archived here.